Here’s the house before we bought it. We didn’t have to look far to get this one. Sue Ann and Lee already owned Russet Valley before our company started. They’d bought it from a woman who had to move quickly and couldn’t afford the needed repairs (thanks to Carol for her hard work as our real estate agent on that one). Once again, we were following our model of making a better life for everybody! They fixed it up well enough to rent, and proceeded to rent it to some friends, Mike and Martha (you know, the ones who just moved to Cameron). The house was rented and cash flowing for four years. Mike did a lot of work, but still, some stuff needed to be done to sell the house for retail. So, yesterday Sue Ann and Lee sold the house to Hermit Haus Redevelopment for what it’s worth minus needed repairs and updates. This way, Carol can work her project management magic on the place and it can be sold in great shape for a new family. 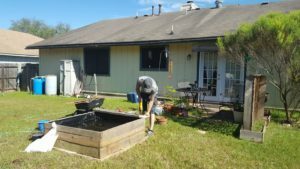 Russet Valley is a 3 bedroom, 2 bath house on a large corner lot in a nice Cedar Park, Texas neighborhood, Buttercup Creek. 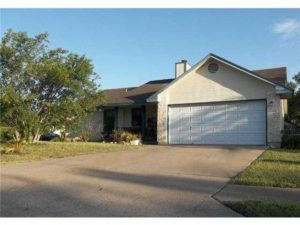 It has a very large master bedroom with a sitting area, a nice front porch, and an amazing back yard with a pond and garden areas. 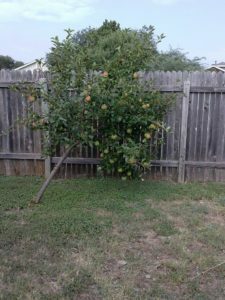 There are fruit trees and other great plants, too, just waiting for a gardener’s touch. There is tile flooring through much of the house, too. That’s a lot of pears. First, we are doing some deferred maintenance. Thanks to hail damage, we could replace the roof with upgraded shingles and only had to pay our deductible on that. We also need to replace some of the exterior siding and repaint the exterior. Inside, there will be more updates to the kitchen and baths, upgraded lighting, and of course, fresh paint! We’ll share more about those plans when Carol has drawn up her plan and budget. We’re excited to work on this one and share the progress!